Japan illustrates the important role governments can play in support of the green economy. In Japan, the government has sought the involvement of science and business in a collective effort to address environmental challenges. With help of government, Japan has contributed to the national economy while reducing pollutants. Rather than focusing on punitive restrictions and costly regulations, Japan has emphasized changes in behaviour that can be taken by every person, family, company and community. According to a research paper by Senior Fellow Carin Holroyd, this position has drawn support from business and from citizens. 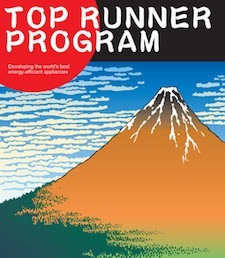 An illustration of this non-punitive approach can be found in Japan’s Top Runner program. This is an innovative system that searches for the most efficient model on the market and then makes that level of efficiency the standard for each product category. The program works by putting the brand image of a company at risk if it falls below the prescribed standards. Japan does not rely exclusively on the honor system; the country is also home to some of the world’s most stringent anti-pollution laws and the government invests in research and development for environmental technologies. In its updated industrial policy, the government of Prime Minister Naoto Kan sees green innovation as a matter of competitiveness for its manufacturers. Despite a large national debt, Japan sees the value of stimulus spending, particularly in the green market. In mid 2010, Japan adopted a green technology growth strategy. This 10-year economic growth plan is centered on green technology and it is estimated that this strategy will create five million jobs. The government’s proactive role in adopting new environmental technologies has encouraged the private sector to develop green products, services and processes. As Japan’s corporate sector became more environmentally conscious, they also discovered new business opportunities. A large number of Japanese companies are looking to grow through green innovation. The Clean Tech Job Trends Report identifies Japan as a clean tech leader and Ernst & Young anticipates fourfold growth in Japan’s solar panel market by 2020. The strength of Japanese environmental technology exports illustrates how the green sector can fuel economic growth. Green innovation is fundamental to prominent Japanese firms like Panasonic and Hitachi. Panasonic expects to triple its revenues to $36 billion by expanding its energy businesses including electric-vehicle batteries and hydrogen fuel-cell generators. Panasonic is also greening its manufacturing operations and doubling its use of recycled materials while raising the recycling rate for its own industrial waste to almost 100 per cent. Other Japanese firms are also seeing remarkable growth from their clean tech investments. Sharp has built a new solar-cell factory that will raise its output to 1.3GW in 2010, that is up from 790MW in 2009. Sanyo has re-emerged as the world’s largest maker of rechargeable batteries and Toyota, Nissan, Mitsubishi and Honda are all selling battery-driven electric vehicles. Other successful Japanese environmental technologies include systems which harness waste heat and gas to generate power. Japan’s investment in environmental technology has led to significant trading opportunities. In its green trade with China, Japan reaps economic benefits, but as pollution does not respect national boundries, Japan also directly benefits from pollution reduction in China. As reported in The New York Times, despite prodigious growth, Japanese industry was able to reduce energy consumption while lowering emissions. Japan’s conservation record has been good for the environment, but conservation has also reduced operating costs and spawned an entire industry in the process. Japanese companies have to deal with increasing competition from Chinese producers. For example, Chinese solar-panel makers have already surpassed Sharp in volume. However, Japan’s advanced technologies afford higher energy conversion ratios and therefore higher prices. According to a research paper released by the Centre for International Governance Innovation, Japan shows that governments and corporations can be more green while gaining political favour and bolstering their national economy. While nations across Asia are finding new green niches, in North America and Europe, short term economic interests are trumping government investments in environmental technology. However, many Asian nations are demonstrating that being green does not necessitate dire economic sacrifices. While America dithers, China’s automobile industry has eclipsed the once mighty US auto industry. China now produces more cars, but they also produce staggering numbers of hybrid and fully electric vehicles. In the US, the results of the 2010 midterm elections mean that we are unlikely to see green legislation in the next couple of years. In Europe, the situation is not much better with public and sovereign debt eroding leaderships across the continent. Although Japan has a large debt load, it is well positioned relative to other countries. According to the International Energy Agency, Japan consumed half as much energy per dollar worth of economic activity as the European Union or the United States, and one-eighth as much as China. Japan also has the lowest levels of carbon dioxide emissions by GDP among major industrialized countries and public transportation accounts for almost half of all movements of people. As Americans continue to debate the veracity of climate change science, and Europe succumbs to austerity measures, the Japanese government is promoting green sector opportunities. Japan’s efficiency measures and green investments are already paying lucrative dividends. Environmental technology is big business, and Japanese firms have a tremendous competitive advantage.